Dan Sileo (born January 3, 1963 in Stamford, Connecticut) is a sports radio personality. Sileo started his sports career at Stamford Catholic High School (now Trinity Catholic) in Stamford, Connecticut. He is the highest drafted NFL player from Stamford, where he led Catholic High to two straight city crowns and was named all city three times and was also named All-State in football by the CIAC. Sileo made the Adidas High School All American football team in 1981. Before his current career, had a short NFL career as a defensive lineman, playing for the Tampa Bay Buccaneers, and appearing in preseason games for the Detroit Lions and the Dallas Cowboys. Sileo was also an All-League catcher in 1980 for the Princeton Tigers (Princeton, Illinois) of the Connie Mack league, hitting .286 with 18 home runs and 63 runs batted in as a catcher. Sileo is also a winner of the President’s Physical Fitness Award six times from 1973-1978, an award that comes from the President of the United States. Sileo transferred once during his college career. He started at Maryland, where as a freshman he played in 10 games and broke NFL Hall of Famer and former Terp Randy White’s freshman bench press record with a 435-pound press. Sileo was a member of the University of Maryland’s 1983 Atlantic Coast Conference Championship football team. Sileo lost his scholarship when he tossed a student from a first-story dorm floor into a snow bank. It was believed that Sileo spent the summer riding with the gangster biker gang the “Hells Angels” chapter of Bridgeport, CT. He then went to the University of Miami Hurricanes, where he won his scholarship back, teamed with Bill Hawkins, Danny Stubbs, and Jerome Brown to form one of college footballs greatest defensive lines. In July 2010, Sileo’s 1986 Miami Hurricanes were voted the most hated American sports team in history by Sports Illustrated. Sileo is the strongest player in Miami Hurricane history, with a 535-pound bench press and 700-pound squat and running a 4.81 40-yard dash. 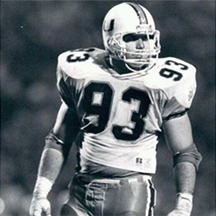 In 1986, Sileo led the Hurricanes defensive line in solo tackles and tackles for loss and third in sacks and first in fumbles. He was also the leading tackler in the 1987 Fiesta Bowl, where Sileo started the game off with a QB sack of Penn State QB John Shaffer; Miami fell 14-10 to Penn State. He made All South and was an All-American honorable mention. He was named to the Sporting News preseason All American team in 1987. Sileo in 1987 was a Sporting News pre season Outland Trophy canadate. Sileo was named to Sports Illustrated’s All-Time Walk on Team in 1992. Sileo’s bowl teams were the 1983 Capital One Bowl, 1986 Sugar Bowl and the 1987 Fiesta Bowl.